The locr team is back from drupa and fully recovered! The eleven-day event was a valuable experience for locr, and we wanted to hear more about the lessons, ideas, and opportunities that drupa provided. What follows is an interview with the locr team, including: Randy Hardy, North American business development representative, Thomas Schnettler, who leads European business development, and Tony Hodgson, who oversees marketing for locr and is based in the UK. Each of you represents a different part of the world for locr. What lessons did you learn that surprised you? Thomas: Of course drupa is a global event, so you are talking to people from all over – Europe, North and South America and many people from the APAC Region. In these conversations, you explore their ideas, thoughts and needs. You realize that printers around the world are experiencing similar challenges about adding value for the client’s they serve. These printers are coming to locr because they know that our maps and GEOservices will help them achieve that goal. It’s all about adding value. Randy: I agree, Thomas. What I enjoyed seeing was what I’d call a global collaboration. locr has worked with a lot of printers to include maps in some creative direct mail projects. We had samples of these projects on display at drupa, and it was wonderful to see printers from other regions look at these samples and be inspired with ideas for their own campaigns. It just goes to show that no matter where your business is located, including personalized routing information adds value to printed communications. Tony: Yes, this opportunity is truly global! I think this global interest comes from our geodata source, OpenStreetMap. Using OSM as a data provider gives us the confidence of knowing that we can create maps of any location in the world at the highest levels of accuracy and detail. As a result, we will develop some valuable relationships in new regions of the world over the next year. Was that the goal of locr partnership activities at drupa? Thomas: We talk about adding value to print, and these partnerships were a way for us to further demonstrate that point. The handout we produced with HP is an example of bringing value to print. 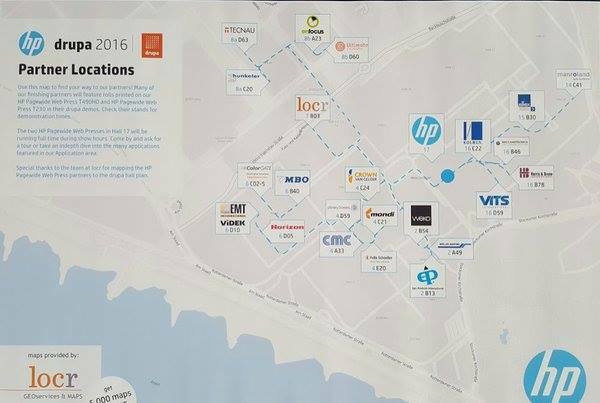 This handout really showed the power of maps – on one side you could find all the HP locations at drupa, and on the other side was a map of the critical information everyone needs: the bars in Düsseldorf! 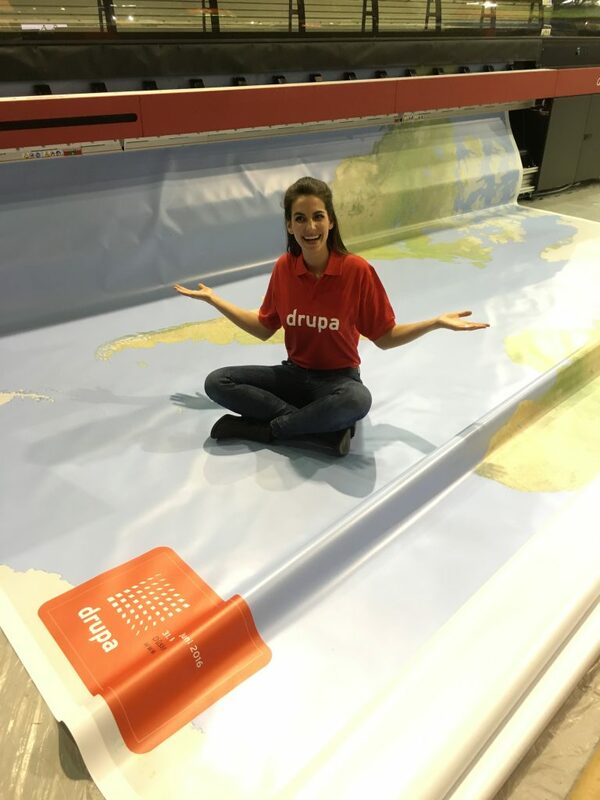 Over a million of these drupa maps were printed. Getting maps into the hands of that many people clearly demonstrates how combining print and maps makes for a powerful combination. Tony: We also worked on a special project with our partner EFI to create the largest map ever produced at drupa. Not only was the map big, it included a level of detail that was really fantastic. The printing of that map showed – in a big way – how maps add value to wide-format printing. Most importantly, it helped us to make the point of what can be achieved with maps. Randy: It was great to be working with our existing partners like HP and XMPie at drupa. But the value of these partnerships doesn’t end at drupa. We will continue to work with these partners to extend the value of the locr solution and better service our joint customers. 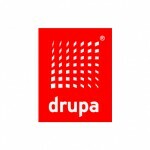 What lessons did you learn at drupa? Tony: drupa also gave us the opportunity to discover what our customers and partners need from us to help them explain the value of personalised maps to their customers. This feedback is so valuable to us, and we will use it to create materials and messages that better reach all end-user customers. Thomas: At drupa, it was clear to see how far digital print technology has come. Printers are adopting this technology at a growing pace, and we saw that progress demonstrated at the stands of our partners like HP. As these new digital presses get implemented, printers need applications that can help them to get the most out of their investment. That’s why interest in our personalized maps was so high at drupa. These maps let printers easily add a highly-personalized element to the printed communications they digitally produce for their clients. Randy: drupa always gives us a chance to see how far the industry has come since the last drupa. The advances in digital printing – as well as the growth of locr – clearly show that growth. I’ll just add that this locr team is really great. All day, every day, for eleven days their enthusiasm and dedication never failed. 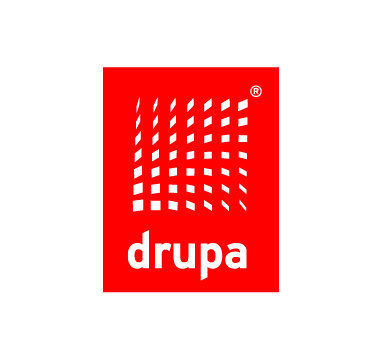 This team – and the great partners and prospects we talked to – were what made drupa such a success, and are at the heart of what makes locr such a special company to work with. Want to know more about the locr Services and how to add value to your marketing campaigns? Just write us an email at info@locr.com or have a further look at our locr Blog about direct marketing, adding value to print and the latest news from the industry.